Today I just want to share a fun idea for lunches that even your youngest children can help you make, personal thin crust pizzas. To give you an idea how your kids can help you make these I will share what mine did when we made them. Chloe, my three-year old, put all the toppings on her pizza while I supervised, as to make sure she didn’t go over board. Paige, my two-year old, sprinkled the toppings I had already set out for her after I had put her pizza sauce on the pizza. I also want to note that these are great for lunches because they come together quickly, and take only a little bit in the oven. I also think they are great because they can be made according to each person’s preferences. So today here is my recipe for the one I made myself. 1. Pre heat oven to 350 degrees. Place your tortillas on a small pan. Spread your pizzas sauce on the tortillas. 2. Spread your handful of mozzarella pearls around each pizza, one handful per pizza. 3. 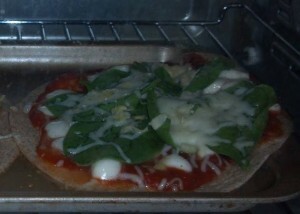 Lay out your fresh spinach leaves on top of the mozzarella. 4. 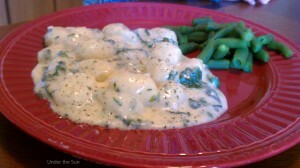 Sprinkle your Italian blend cheese lightly on top on of spinach. 5. Grate one small clove of garlic over each pizza. 6. Place your pizzas in the oven for 5-6 minutes. Check pizzas at 5 minutes. If the cheese is melted and bubbly they are done, otherwise let cook for another minute. Then enjoy! This entry was posted in Homemade, Recipes and tagged cheese, Kids, pizza on September 4, 2013 by Sara R.
Here is another old post, that I am dusting off. Originally it was titled, “Giving My Baby Cakes a Little Variety.” I felt, “Canning: Fruit Purees” was a little more to the point. 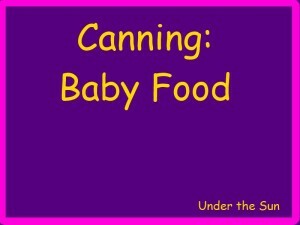 It is also worth noting this is the follow-up post to Canning: Baby Food. 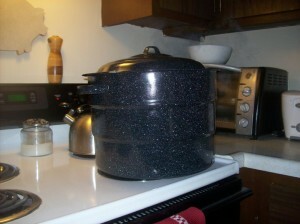 The big bath canner I use. The other day I took to canning more fruit. This time I was a little more adventurous than just applesauce. Chloe now has two new kinds of fruit purees. The first batch I made was apricots, bananas, and pears. To use up the few apricots that I had left after that I made apricot, mango, and apple purée. Now to be fair we have not sampled these purees yet so I have no idea how she will take to my recipes at this time. I do know though she has eaten all these fruits at various times before. Before canning more food this time I bought some additional supplies and a book that I would highly recommend to anyone looking to can anything whether it be food for your baby or a stew for the family. It is the Ball (R) Blue Book guide to preserving. This book provides tested methods and advice in home canning. If you combine that with USDA link I provided in my last note then even the most inexperienced person can go forth with confidence. As far as my two recipes are concerned I spent approximately $3.50 on all the fruit. To put that in perspective for the same amount of money I could have maybe 2 packages of the Gerber brand, or 3-4 jars of Nature’s Best. Yes there are brands that will come in for less than those two, but those have been the primary brands we have fed Chloe. Granted she also likes the Plum brand; one four oz package of that is around a $1.79. When I bought additional canning supplies, I also purchased Fruit-Fresh Produce Protector. I feel this is worth noting because it is optional in the recipes. This product helps the fruit from getting a brown color during the canning process. It is by no means a must have, the fruit will still be just as good with out it. The other thing it does for your fruit is it adds vitamin C. In fact this product adds 230% vitamin D for just 1/4 tsp. Processing time for the jars is 15 minutes for either pints or quarts when you are 1000 ft or less above sea level. (To adjust for higher elevations please refer to the link in my previous note or the guide in the book I provided.) After processing time let canner cool five minutes before removing jars. Let the jars cool with at least two inches between them for the next 12- 24 hrs. After that time period you can check to see if your seals took. This entry was posted in Homemade, Recipes and tagged canning, Children, fruit, Recipe on August 28, 2013 by Sara R.
This summer you might have seen me tending my garden if you happened to come by the house. My most successful harvest was the herbs I had planted. I experimented with several different kinds of basil this year. I had my go to basil, sweet basil. Then the next variety I was eager to work with was the Boxwood basil. I also planted a purple basil but mostly because I thought it looked pretty. So imagine my surprise when purple basil quickly became my new favorite. I made caprese salad pasta with it. I used it in marinara sauces. I even threw it in a few odd dishes. It has this wonderful aroma and flavor that I find hard to describe, but love to savor. I took one final trimming with me yesterday after I turned over the keys. This evening I used those trimmings to make a dish, that to me, just screams summer, caprese salad. I made it for lunch tomorrow but I just had to have a bite tonight and it was so fresh and delicious. Your main stars to a caprese salad. 1. Dice up your tomatoes. (You will want to be sure your tomatoes are as ripe as possible.) Place in medium size bowl. 2. Drain your mozzarella pearls. 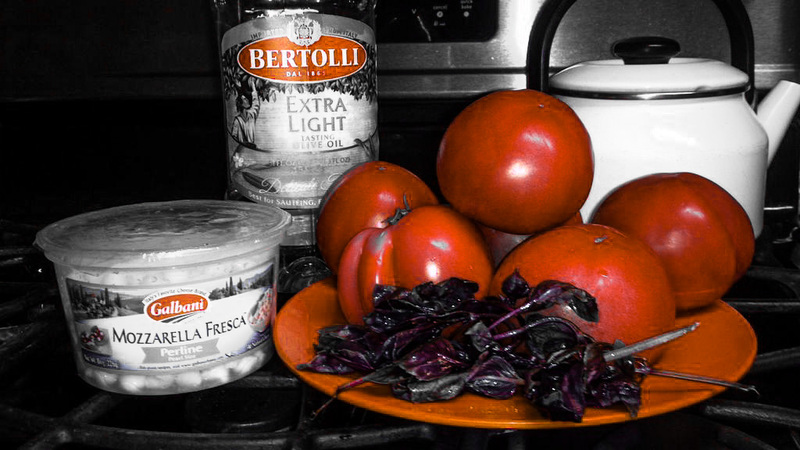 Then gently stir mozzarella and tomatoes together. 3. Measure 4 tablespoons olive oil into your bowl. 4. Cut basil strips and sprinkle in your bowl. 5. Lightly season with salt, and then stir all your ingredients once more. This entry was posted in Homemade, Recipes and tagged cheese, Recipe, tomato on August 21, 2013 by Sara R.
(Note: This is an old post I am dusting off and pulling out to share, since we are back to moving ourselves again. Today has been a day full of bad news in our house, one piece of which is I have lost the help of professionals and now must start packing again. So I hope you enjoy this old piece and find the information helpful, while I get busy packing. Last night was what promises to be the first of many adventures in making and canning my own food for Chloe. Now in talking to people I have heard some objections to this that I would like to address before I tell of last night’s work. Well I suspect that a few hours a couple of times a month is well worth the savings. For example two apples produce 16 oz of applesauce. I made my apple sauce in what was one of the more time-consuming methods and I had 48 oz in 30-45 minutes. There are methods that will save more time and energy in making the food, but they require more initial money for the output. The USDA has tested different foods and has laid out safe practices in processing food for home canning. If you follow their advice you will significantly reduce the likelihood of botulism, and other illness you or your child could face from tainted food. Well you can finely dice your veggies and follow their recommendations for the appropriate vegetables and mash them up before serving them to your child. Or if your child has teeth let them try the vegetables that are cut up to just their size. As far as vegetables go it has been my experience that many doctors recommend serving them to a child after you have started with fruits anyway. So you can get started with the fruit you made up first and worry about veggies when you cross that path. Pureed fruit can be added to cereal it, put atop of many foods, or enjoyed as a snack for even adults. So having plenty of fruit around even past the first year will be a nice thing to have. Finely diced veggies can easily be mashed and served to a baby without teeth, and as they grow you can give them the diced veggies as a finger food at meal time. If you have further questions or concerns please feel free to post them here. I will answer all questions that I am able. If I do not know the answer I will look it up and provide you with the source of my information. 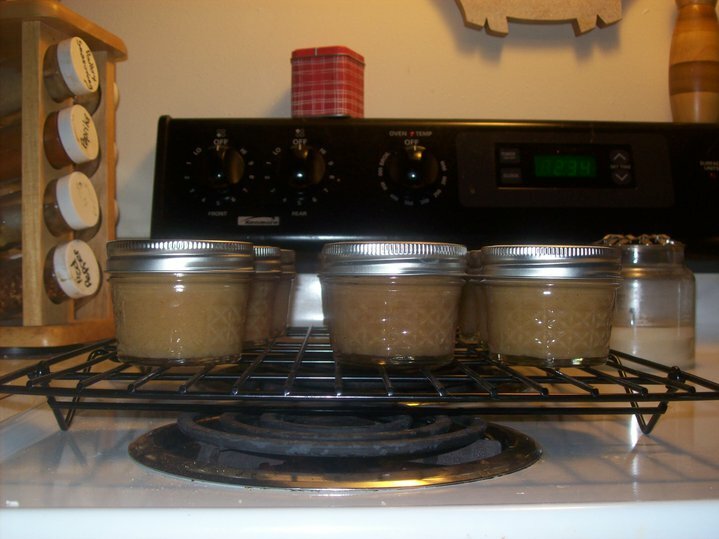 This recipe for applesauce was simple and the results were very tasty. Now you can modify it if you have a food processor, a hand cranked Foley food mill, or a KitchenAid grinder that you would prefer to use. Please note I also made my applesauce two apples at a time. 2 apples (for approximately 16 oz of applesauce) *note* I used one sweet apple and one tart. 3. Fill the Ziplock bag to the fill line. Then add the cinnamon and sugar, plus additional sugar if desired. 4. Add the tablespoon of water. 6. Be careful opening the steam bag so as not to burn yourself, and pour the cooked apples in your blender. I used the puree setting to get my apples to the desired consistency. 7. Pour your applesauce in your jars. 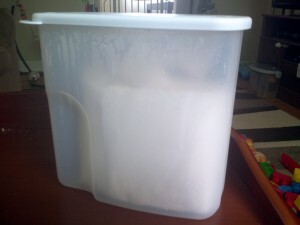 Be sure to leave a half inch of head room at the top of the jar and remove any air bubbles that may have formed. 9. Wipe rim of jars with damped paper towel to clean an spillage. Finger tighten lid and ring onto jar. Once you have repeated this process enough times to fill enough jars to fill your canner, or until you have as many as you would like to make, then you may begin processing the jars. Remove from boiling water and set the jars on a cooling rack. Let the jars cool overnight. The popping and hissing noises you will hear as the jars cool are perfectly normal, in fact the popping noise indicates the jars are getting the proper seal. The next morning check on the jars. If the buttons on the lids of any of the jars are not indented then the seal did not take. At this point you can put the jar in fridge to be consumed in the next couple days or the recommended advice would be to re-can the appropriate jars. That would entail re-cleaning the rims, putting on a new lid and boiling the jar again. If the seal does not take this time the USDA does recommend, for safety’s sake, a third attempt. **Note: If your local elevation is more than 1000 ft above sea level please refer to USDA fruit canning guide for the appropriate amount of time to add to the canning guidelines that I laid out. 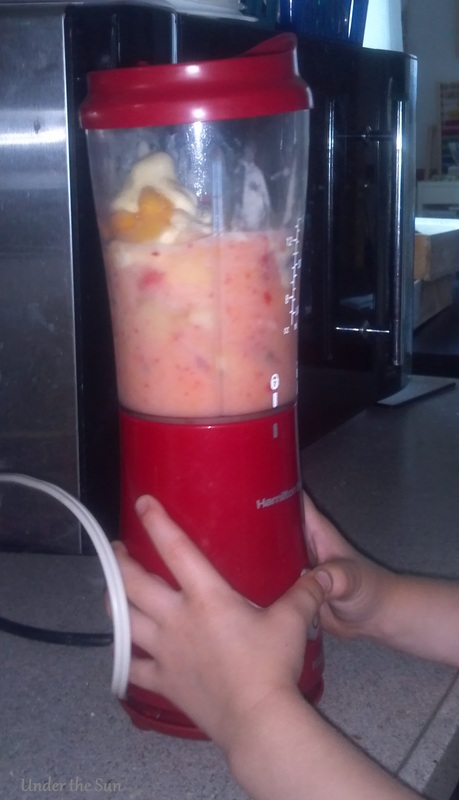 This entry was posted in Children, Homemade, Recipes and tagged baby, Baby Food, Children, Recipe on August 14, 2013 by Sara R.
Sometimes I think I get stuck in a rut with my cooking. I like to make oven fried chicken with chicken legs. Pulled pork, chicken, or beef can be made into hash, tacos, quesadillas, or sandwiches. Then there is pan-fried pork chops, steaks, General Mama’s, beef and broccoli, spaghetti (in its many forms,) macaroni and cheese. Then there is the weekly pizza night. After awhile of repeating the same meals I just need to do something different. 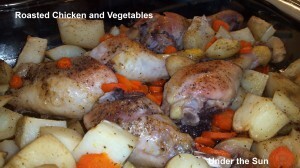 Today that something different was oven roasted chicken legs and vegetables. I searched the internet for ideas on what to do with chicken legs and potatoes and came across this recipe for Garlic Roasted Chicken and Potatoes. I will be honest I wasn’t 100% sure about the maple syrup addition but it was well worth the add to the recipe. It gave it the little something that it needed. I did make a couple changes from both the pictured dish and the written recipe. The dish pictured shows pineapple. 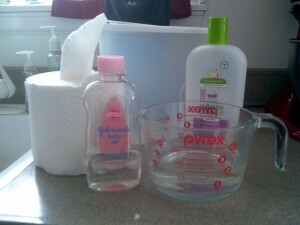 I omitted it for two reasons: 1 my husband is allergic and 2 since he is allergic to it I don’t keep it in the house. It is also worth noting the pictured dish shows carrots where the recipe doesn’t include them. So unlike the recipe I added carrots and I used onion powder and seasoning salt in addition to the pepper to season the dish. I probably should also mention I have no idea what kind of potatoes I used because I got them fresh from a friend’s garden, but a good baking potato should do just fine. I will also note that I used just the chicken legs because that was what I had on hand. If you don’t have quarters use legs, thighs, wings, breasts, or boneless if you must. No matter what you have this will still be a delicious recipe that comes together easily. 1. Pre-heat the oven to 400. 3. Place you chicken in the bottom of your pan followed by potatoes, carrots, and garlic. 5. Slice up butter into patties and place around the meat and veggies. 6. Cover the meat and vegetables with foil wrap. Bake for 40 minutes. 7. Drizzle with maple syrup. Place pan back in oven for another 20 minutes. 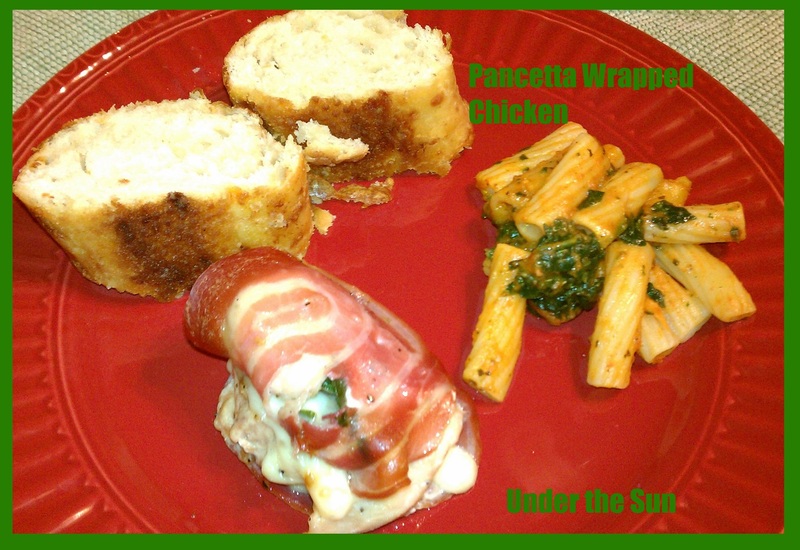 This entry was posted in Homemade, Recipes and tagged Carrots, Chicken, Potatoes, Recipe on August 7, 2013 by Sara R.
So I have sat here for several minutes trying to think of the best way to describe Pancetta Wrapped Chicken, and I am at a loss for words. I can tell you that my family absolutely loves it and I swear I feel like it melts in my mouth, but that description still feels lacking to me. All I can really say is give it a try. I am sure you will love it just as much as we do. Now you will just need to pull out the tooth picks before enjoying. Note: My husband pointed out that not everyone will want to use mozzarella slices. That is fine. This recipe will work great with cubed, fresh, sliced, or grated. Use what tickles your fancy, or whatever you have on have. I just prefer the slices in this recipe. I feel they make it easier to roll the chicken up. This entry was posted in Homemade, Recipes and tagged cheese, Chicken, Pancetta, Recipe on August 1, 2013 by Sara R.
I am breaking into my stockpile of recipes again. 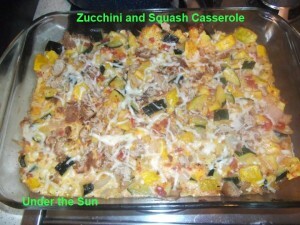 This time it is my Zucchini and Squash Casserole. It is a delicious casserole that is light enough to enjoy even with the heat of summer. Preheat oven to 350. Spray a 9 x 13-inch baking dish and set aside. Put the squash, zucchini, and onions in a large pot with a small amount of water over medium heat. Bring to a simmer and cook until tender, 8 -10 minutes, then drain into colander. After you are sure the excess water has completely drained pour mixture in bowl, add your drained tomatoes, and 1 cup mozzarella. Gently mix ingredients together. Pour the vegetable and cheese mixture into pan. In a separate bowl combine eggs, Natures Seasons, and pepper. Pour mixture over veggies. Place baking dish into the oven for 20 minutes. Top with the bread bits and cheese. Bake an additional 10-15 minutes. This entry was posted in Homemade, Recipes and tagged Casserole, Recipe, Squash, Zucchini on July 25, 2013 by Sara R.
Making our own frozen treats is not only fun, but a great way to save money. Making homemade popsicles is an easy process that allows for assistance from little helpers. This is a really good thing, since time in the kitchen working together can be such a great bonding experience, and my girls love being Momma’s helpers. 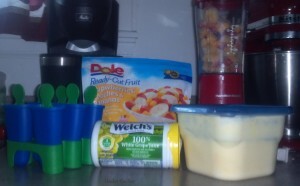 Put your yogurt in the blender, followed by the fruit and a 1/4 cup of the fruit juice. Start blending the mixture together. You will want to continue to add the juice a 1/4 cup at a time, until fully blended together. 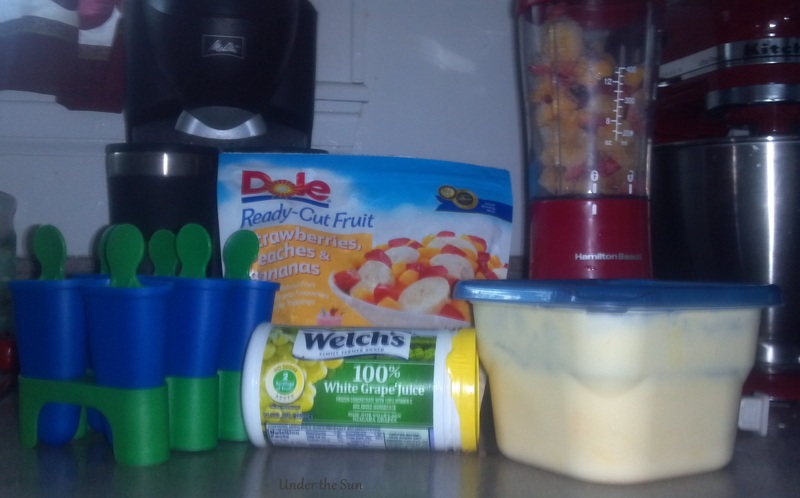 Use a small spoon to scoop the smoothie into the molds. You will want the molds almost full. Leave just a little bit of room at the top for the smoothie to expand as it freezes. Set in freezer for 2-3 hours or until completely frozen. When you are ready to enjoy one, just run the mold under hot tap water to loosen your treat. On a quick side note, they got the name smoothie pops because that is what my three-year old calls them. This entry was posted in Homemade, Recipes and tagged frozen treat, Popsicles, Recipe on July 18, 2013 by Sara R.
This recipe is hearty enough to enjoy as a main dish or it can make an excellent side with roast chicken or a grilled steak. It is a recipe that has grown up appeal but can please even young children. Check it out and let me know how this recipe works for you. Please note: As I make my cheese sauce I may adjust measurements here and there to either adequately cover the noodles I have, or to help bring it to a better consistency. (I like my sauce smooth and creamy.) I also want to point out that I use whatever cheese I have on hand that I think my children may eat, with one exception: cream cheese. I try to make sure I always have some cream cheese on hand for when I want to make mac n cheese or creamed spinach. 1. Melt butter in sauce pan over medium low heat . 2. Whisk in a couple oz milk and creamed cheese. 4. Start sprinkling in your mozzarella, Parmesan, and cheddar stir continually. When the mixture becomes thick and tough to stir had a few more ounces milk. Continue like this until the cheese is melted and creamy. 5. When creamy add cottage cheese and turn heat to low. Stirring occasionally. 6. Season with salt and pepper to your preference. Follow directions on package. You will know they are done when they all float. When the gnocchi is done cooking drain, lightly cover in light olive oil. Then cover with cheese sauce. This entry was posted in Homemade, Recipes and tagged cheese, Gnocchi, kid friendly, Mac n Cheese, Recipe, spinach on July 11, 2013 by Sara R.